1. Who will win the race? My initial thought for this lesson was to focus on what it could look like in a Pre-Cal or Calculus class. However, I’m intrigued by the possibilities for earlier subjects as well. More on that in Act 2. The students need to know the speeds. Proportional reasoning can be used to figure out the meters per second for each vehicle. Next, we need to know the distances that each will travel. This is where teacher options are presented. First, let’s see an image. 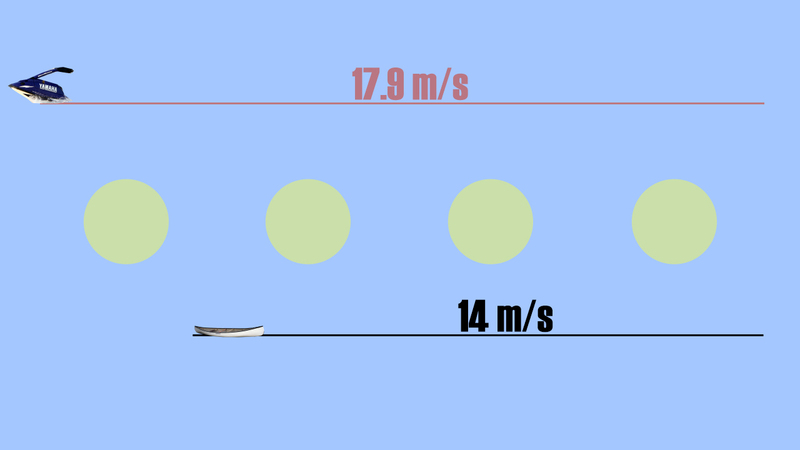 The rower distance is 500 meters. However, work needs to be done to find the Jet Ski distance. Honestly, I didn’t know how to calculate this, but thankfully, Michael Fenton was a huge help. @DaneEhlert @robertkaplinsky I’d try this (https://t.co/MJ3t1DI5O2) or this (https://t.co/7t7OgnG4eo). So, here is my vision for the task. If you’re a Pre-Cal or Calculus teacher, let your kids try to figure out the distance with the image above and/or this Desmos graph (includes the equation I used). However, if you teach an earlier subject, here are some other routes through the lesson. There’s a lot of potential for ratios and proportional reasoning in this task. For example, here is how I figured out the Jet Ski distance (thanks to Michael). WolframAlpha did the calculation for me. 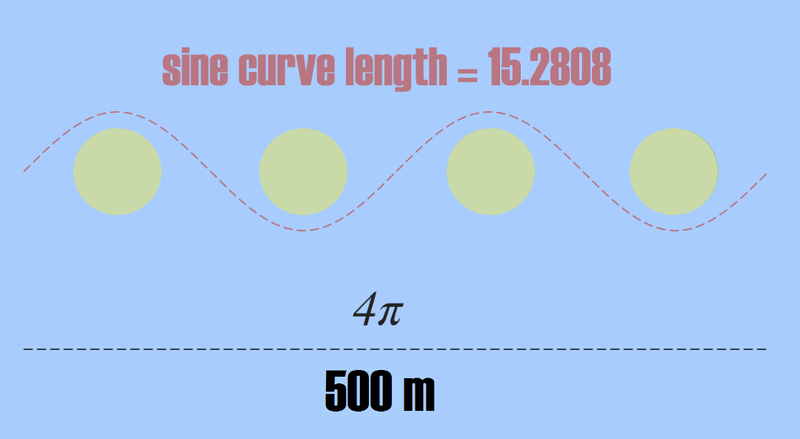 15.2808 represents the arc length on the graph. From there, I used a proportion to determine the distance in meters for the problem. Granted, it might be a lot to ask for a middle schooler to figure this out. Therefore, this picture could be helpful (here’s the link to the graph as well if you’re interested). Once the students figure out the Jet Ski distance, they can divide the rates for each and determine the solution. In the Elementary grades, this lesson can be modified to work on division and division with decimals. Show the kids this image. Also, if they aren’t ready to calculate the speeds, show them this image. 5.What would happen if the Jet Ski was going 50 mph, and the course looked like this? I’d love to hear how this plays out with students. Will you have an opportunity to use this in the classroom? Thanks Michael! You helped me more than you know. Unfortunately, I don’t think I’ll get a chance to use this for a while. It doesn’t really intersect with the learning goals for the rest of the year. I’m curious to see what an upper level class could do with it though.